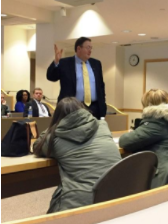 On a recent Saturday, Andrew Parker CPC was a guest speaker at Quinnipiac University Youth Officer Training Academy. This Academy is committed to providing both leadership and practical skills-based training to all elected leaders of youth organizations and governing councils. At the beginning of each new term, new officers are required to attend a comprehensive leadership conference that explored topics such as policies and procedures, maximizing membership involvement, organizational branding, accountability techniques, advanced leadership skills, and more. 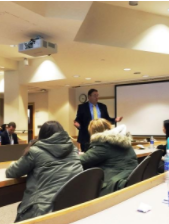 University faculty and administrators, alumni and industry experts develop and facilitate workshops and presentations that are in line with Quinnipiac University’s Essential Learning Outcomes.